Toddlers and summer are two words that go well together. Nice weather provides the perfect outdoor opportunity for young children to have fun, learn a lot of new things, and become independent and adventurous. Summer is the best season for satisfying all of these needs! Anyone with a toddler knows the bull-in-the-china-closet aspect of this age. Children between the ages of 18 months and three years have learned enough gross motor skills to be very mobile and to want to get into everything. However, they have not acquired enough fine motor skills to prevent fingers from getting caught in places and the coordination to prevent falls; in addition, the attention span of this age group can be alarmingly short. All of these aspects of this stage of development can make the inside of a house a difficult environment. First and foremost, your house can be dangerous no matter how much baby-proofing you have done because toddlers like to climb and can end up falling frequently. For these reasons, the great outdoors is sometimes safer for toddlers than your own living room, but it depends on where you go outside. Backyard-Your backyard is a good place for your young children, assuming that there are no unleashed dogs in your neighborhood and that you are present to make sure your kids stay in the backyard. This outdoor place can be visited each and every day. Parks-Grassy areas of a local park are excellent places for toddlers to run and jump. While running on the pavement can be unsafe, the grassy areas are soft enough that falling down does not usually mean injury. 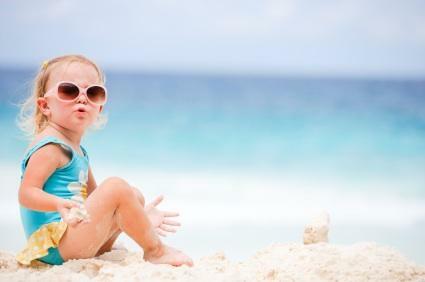 Beaches-Sandy beaches are also a great bet for summer fun for toddlers. While your local pool may be more convenient, running on wet pool decks is inadvisable, and usually strictly forbidden, which you may have trouble teaching a younger toddler. At a sandy beach, your child can play freely. Play toddler games outside or do outdoor activities that can help you and your children have fun outdoors, not to mention encourage your child's development in several areas. Simon Says - This game can be played indoors, but playing it outside allows for more freedom of movement. Encourage the development of your toddler's listening abilities by teaching this game early in life. Outdoor Toys - You don't have to spend a fortune on a swing set or in-ground pool. For toddlers, a plastic slide, swing set, or a miniature wading pool is even more fun than larger playground sets or deeper pools. Having some of this equipment in the backyard can ensure that your kids play outside often. Looking for life and planting it - Talk to your child about the living things that can be found in the backyard: feel the grass, look for bugs and worms, and point out butterflies and bees when they fly by. Being genuinely at home in the backyard is the first step towards a broad appreciation for the great outdoors. If you personally enjoy gardening, involve your toddler in some of the basic tasks of gardening. Smell the flowers - The park is a great place to talk about everything you see around you. Smell the flowers, talk about the birds and their songs, and experience the textures of different types of foliage. Feed the ducks - If your park has a pond, there are bound to be birds living nearby. If your park prohibits feeding, simply watch the ducks with your toddler; for this age group, watching the ducks can be just as spectacular as feeding them. Watch concerts - Many parks have outdoor concerts and other performances during the summer months. Check the schedule ahead of time to look for family-oriented events to enjoy with your children. Build a sandcastle - Playing in the sand is always a hit with young kids; help your child make interesting sculptures to encourage creativity and innovation. Play tag - Toddlers love to be chased, and the beach is a great place to play this classic game. Find a spot where not too many people are so that you don't disturb other patrons. Collect shells - At the ocean, collect shells and talk about colors and sizes. Learning bigger than, smaller than, and shapes and colors is fun at the beach! While you can also take your kids to museums and do other indoor activities during the summer, the weather often allows for outdoor fun. For toddlers, the great outdoors can be a relief; Mom and Dad are usually more lenient about running, jumping, and shouting when outside, which means that young kids can do what they do best without getting in trouble. Another benefit of outdoor activities is that many of them are free, or have lower admissions prices than museums and concerts. Enjoy the great outdoors with your kids for lots of adventure and exploration, not to mention learning and laughs.